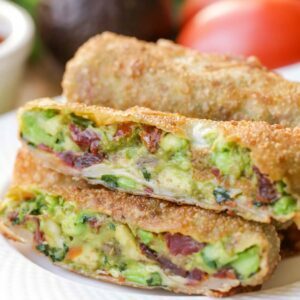 Cheesecake Factory Avocado Egg Rolls - a delicious copycat recipe of this yummy Cheesecake Factory appetizer that everyone loves! Puree this mixture in a blender adding cashews, 2/3 cup cilantro, garlic, sugar, pepper and cumin. Pour into a bowl and add the oil. Stir and refridgerate. In a bowl, stir together avocado, tomatoes, 1 tsp. cilantro and salt. Add 1/2 of the mixture onto the center of each egg roll wrapper. Position the wrapper so the corner is pointing towards you. Fold the bottom corner up over the filling. Fold remaining corners up over the filling and brush the corners with egg to secure in place. Roll up from the bottom folding the top corner over all. Seal with egg and repeat for remaining wrappers. Fry egg rolls for 3-5 minutes or until golden brown.